There are 5 major transit lines within a 5 minute walk -- GO train, streetcars and bus. The unit, with rich oak laminate floors , has an open and very functional layout which makes use of every square foot. Enter the foyer to find a large double front hall closet with sliding doors. Inside you'll also find the front load stacked washer and dryer . Across from the hall closet is the main floor powder room. This elegant bathroom features beautiful porcelain wall and floor tiles , a modern sink and a rich dark vanity. Cook up a storm in the sleek modern kitchen ! Gorgeous mocha laminate cabinetry with undermount lighting, upgraded quartz countertops , and stainless steel mosaic tile backsplash . Sun-filledopen concept living and dining room boasts 17" high ceilings with floor to ceiling windows and a walk-out to the balcony. The open balcony providesprivate outdoor space to have drinks and hang out with friends and enjoy the view of Exhibition Place and Lake Ontario! Spacious master bedroom features oak wood floors anda HUGE walk-in closet . Large picture windows, with up-graded window coverings , will greet your mornings with lots of natural light & cheer! The Master bathroom has porcelain tiled walls and floor, full bathtub with shower , and a modern, large sink. Ownership of 1 storage locker and 1 parking space. Fantastic opportunity for turnkey living in a great neighbourhood at a fraction of the price! Almost all inclusive maintenance fees allow for easy budgeting! This location is considered one of its finest assets being a 5 minute walk to the Lakeshore, 20 minute walk to the financial core and a 10 minute walk from the entertainment / fashion / gallery districts of King St. West, West Queen West, Ossington & Trinity Bellwoods. Around the corner from all the major banks, 24 hour grocery store, and LCBO. Relish an array of specialty stores, shops, bars and restaurants all within a 3 minute walk. Old factories in the area have been repurposed as lofts while others have become restaurants, gyms, furniture stores and galleries. Steps away from Toronto's waterfront and the Martin Goodman trail. Idealfor walking, jogging, or cycling along the lake! Historic brick warehouse & factory spaces at Liberty St. and Hanna Ave. have recently been converted into commercial spaces that comprise Liberty Market. The Market houses design firms and collectives, media, technology and marketing firms, and an eclectic mix of retail stores. Drivers can be on the Gardner Expressway in minutes to head across the city, or to access the QEW, DVP or Hwy 427. 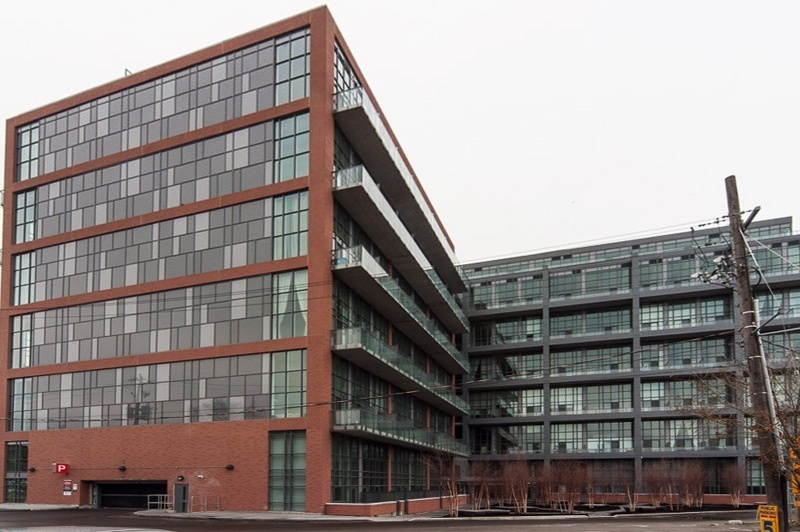 Liberty Market Lofts at 5 Hanna Ave is an innovative architecturally-designed 14 storey loft building, by award-winning Toronto architect Rudy Wallman (Ten York, Lumiere, Bisha), interior design by Union 31, built by Lifetime Developments/BLVD Developments. Common amenities in the building will appeal to someone who wants to live and work in a creative and productive environment . The building's own art gallery near the lobby provides an artistic vibe. Work-related amenities include a business centre with multiple meeting rooms , a room with photocopy, fax and cutting facilities, a computer, and internet access. For the times you need to complete a project with your hands, you can do some shop and craft work in the tool/utility room which has an oversized work bench. Other amenities include: 24/7 security , residents' lounge with a wet bar/dining area and kitchen, designer decorated hotel-style guest suite for overnight guests, on-site dog-washing and grooming facility, fitness centre, yoga studio , and indoor basketball half-court. Cool area - hip coffee shops, popular bars & mouth watering restaurants, and nearby amenities of the warehouse district of Liberty Village . It has been dubbed by many the "hottest" neighbourhood in Toronto! Popular with young affluent professionals -- nearby West Queen West, Ossington, King West, the Lake & the Financial District! 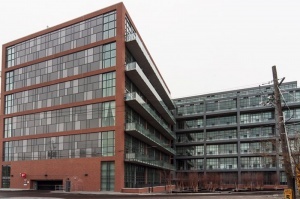 The Liberty Village name was introduced as a positive 'brand' by the property owners and developers in the area in conjunction with the City of Toronto. Its location is considered one of its finest assets being a 5 minute walk to the Lakeshore , 20 minute walk to the financial core and a 10 minute walk from the entertainment /fashion/gallery districts of King St. West, West Queen West, Ossington & Trinity Bellwoods. Steps away to 24 hour Metro , Toronto's waterfront , Martin Goodman trail, CNE & TTC. Liberty Village beckons young professionals and artists. old factories have been repurposed as lofts while others have become restaurants, gyms, furniture stores and galleries. With a walk score of 95 out of 100 this is truly a dream location to live in! Old storage and factory spaces at Liberty St. and Hanna Ave. have recently been converted into commercial spaces that comprise Liberty Market . The Market houses design firms and collectives, media, technology and marketing firms, and an eclectic mix of retail stores. New residential developments are currently focused on East Liberty Street , which begins east of Hanna Avenue. Over 20 new restaurants have opened in the past 3 years, providing the residents and workers in the community with many eclectic places to dine and enjoy their developing "hood". This is a one of a kind opportunity to own such a special true penthouse with a redesigned & customized layout. Few condos in the city have this size of outdoor living space with unobstructed panoramic views from the extensive wrap around balcony and terrace! With the outdoor natural gas barbecue hook up & electrical outlets it is perfect for casual dining and entertaining in those warm spring & summer months. Definite WOW factor for all your visiting friends and family! As you enter the suite you will notice the lofty extra tall ceilings, the endless windows all around , combined with the awesome light stained floors, it makes it feel so light and bright and huge -- very "South Beach"! The entrance includes a deep front hall coat closet as well as a semi-ensuite gorgeous 3 piece bath with marble counters & oversized tempered glass shower stall. The laundry room is uniquely tucked away from the rest of the suite off the master. Master bedroom shares access to the 3 piece ensuite , features a wall of closets with mirrored doors, and berber carpeting throughout with a private entrance to balcony. The gourmet kitchen is a dream and delight to prep/cook and chat with guests! Gorgeous dark rich custom cabinetry with built-in under-mount lighting, upgraded well extended breakfast bar with cabinets below. Brand new stainless steel appliances. The airy and large sun-filled open concept living/dining room works for all sizes of furnishings, home office, breakfast table with breathtaking views surround! Walk-out to the terrace! The cross hall plan includes a second bedroom situated on the other side of the suite with privacy in mind! Double closet, berber carpet, spectacular views and a 4 piece ensuite with marble counters.